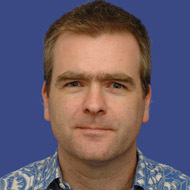 Dr Pete Shaw is a Senior Lecturer in Environmental Sciences at the University of Southampton, and holds degrees in Physics, Environmental & Ecological Sciences, and Biology. He teaches a wide range of subjects, from study skills to advanced field courses, freshwater ecosystems, river management, and waste minimisation, and from first year undergraduate to masters level. His research interests are in both aquatic environmental sciences and waste management. In aquatic environments, his research concerns primarily the influences of anthropogenic processes and actions on the quality and composition of habitat and organisms. Research in this area has focused on rivers, estuaries and near-shore coastal waters in the UK, addressing the impacts of human activity (physical and chemical) and their mitigation and management. His research interests in waste management orient around the necessity to engage individuals in waste reduction, reuse and recycling as a means to achieve desired reductions in residual waste arisings, aiming to determine how and why householders’ perceptions and beliefs lead to their recycling behaviours. Pete was Memeber of the IES Council from 2010-2016, initally joining as representative of the Committee of Heads of Environmental Sciences (CHES). As Chair of CHES, he is responsible for overseeing IES accreditation of educational programmes. Acting a key link between the IES and Environmental Science education in UK universities provides an excellent view of the needs and expectations associated with professional practice in the environment sector. This position helps enormously in ensuring environmental science and related degree programmes recognise and provide opportunities for students to develop the skills and competencies needed for their careers, which is a key concern of CHES and its members.